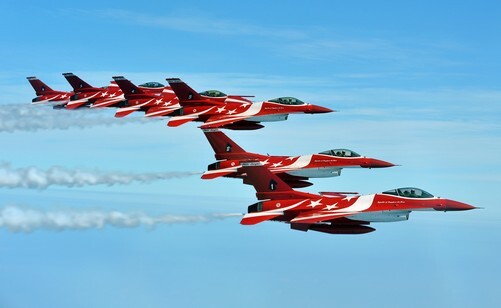 The six F-16C Fighting Falcons of the Republic of Singapore Air Force Black Knights display the red-and-white livery featuring the crescent moon and five stars, symbols on Singapore's national flag. 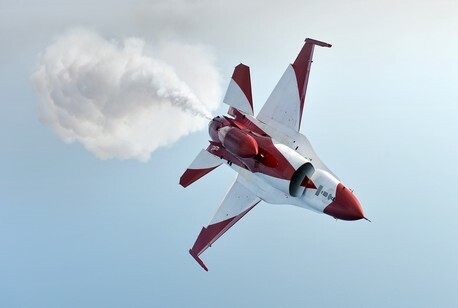 Screaming through the air at 400 knots or 740kmh, six red-and- white fighter jets curve gracefully over the showground, flying barely 3m apart. 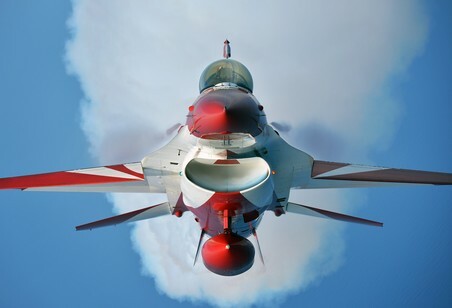 On cue, they break ranks, streaking out and up, painting a perfect bomb burst of smoke trails as their machines surge skyward. 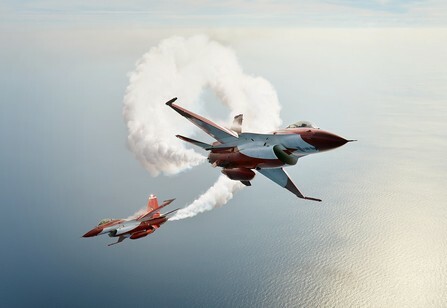 "Smoke off… go!" commands the team leader. The billowing white abruptly ceases as they rendezvous for the next manoeuvre. 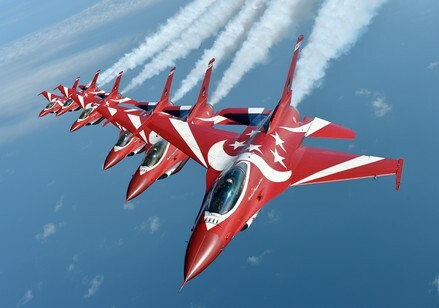 These are the Black Knights - the Republic of Singapore Air Force (RSAF) aerobatics team. 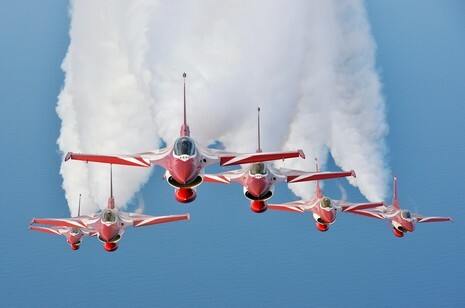 First formed in 1973, the team pulls together some of the best fighter pilots in the service to perform at air shows, and this year in particular, at Singapore's Jubilee weekend celebrations. 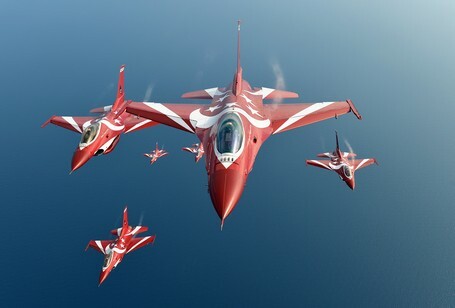 Only flying instructors with at least 500 flying hours are eligible to make this year's team, the 14th in the RSAF's history. 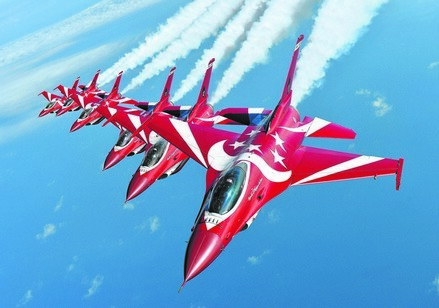 Formed just six months ago, they train five days a week, practising over the Southern Islands. 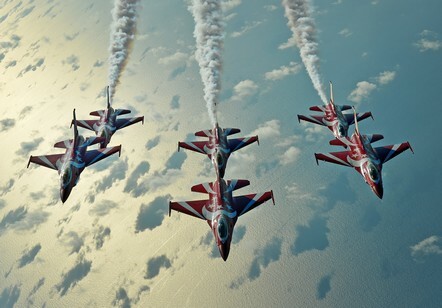 Unlike many aerial display teams, such as the Royal Air Force Red Arrows and the Patrouille de France, the Black Knights are not a permanent or full-time show. 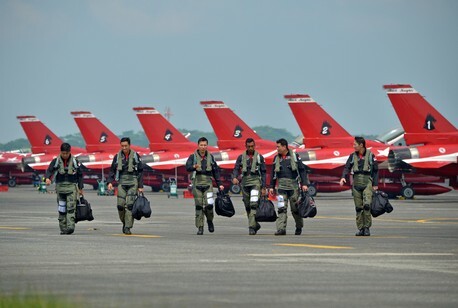 The eight aircraft (two spares), six pilots and 50 ground crew are drawn from combat-ready squadrons and can be returned to operational duties at a moment's notice. 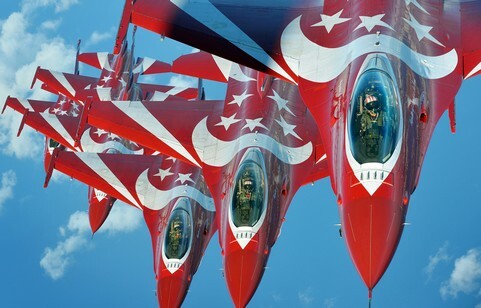 Because of this, the Black Knights fly unmodified front-line fighters, the F-16C Fighting Falcons, but painted in red-and-white livery featuring the crescent moon and five stars - symbols on Singapore's flag. Black Knight 5 Major Eugene Lim and Black Knight 6 Major Chang Haw Ning execute a rolling manoeuvre close to each other. 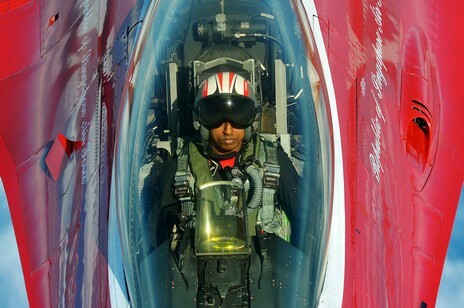 Captain Devdutt Sasidharan, 29, callsign "Gambit", flies the “Right Wingman” position with the Black Knights. 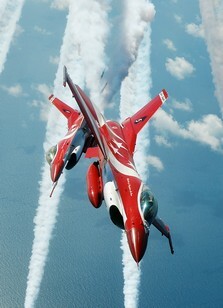 Major Derek Chan flies the “Slotman” position with the Black Knights. 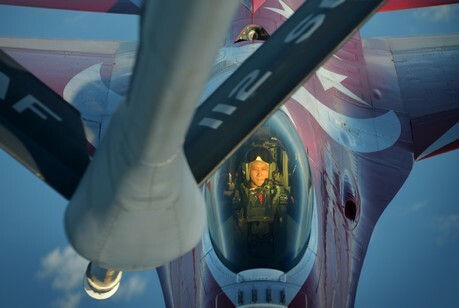 He pulls up behind a KC-135R inflight refuelling tanker over the South China Sea. 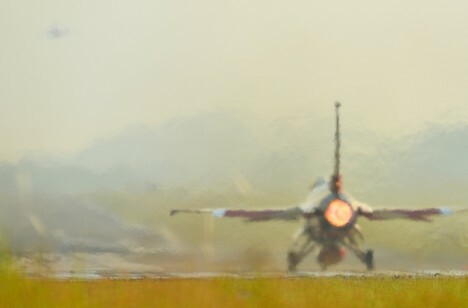 Black Knight 6 Major Chang Haw Ning, the team Opposing Solo, executes a slow-speed aileron roll to the left. Black Knight 5 Major Eugene Lim (R) and Black Knight 6 Major Chang Haw Ning execute a Needle Cross manoeuvre close to each other. 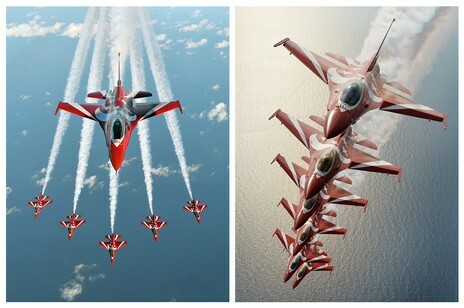 Six F-16C Fighting Falcon aircraft of the the Republic of Singapore Air Force Black Knights aerobatic team fly in formation over the South China Sea. 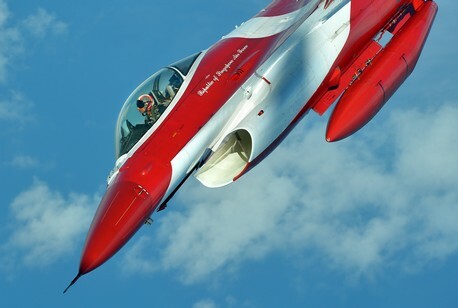 Captain Devdutt Sasidharan is an F-16 fighter flying instructor with 145 Squadron, with over 1,500 hours of flight time in his nine years with the air force. Fast and slow passes, vertical climbs, rolls, and extremely tight turns that subject both man and machine to high g-forces. 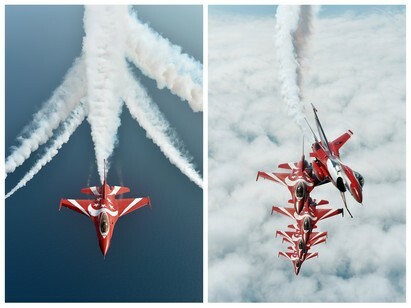 Black Knight 5 Major Eugene Lim and Black Knight 6 Major Chang Haw Ning, the Lead and Opposing Solos of the Republic of Singapore Air Force aerobatic team, execute a rolling manoeuvre close to each other. 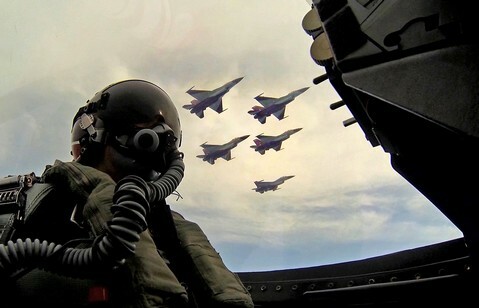 Black Knight 4 Major Chan, 37, a former A-4SU pilot instructor, has flown over 3,000 hours during his 17 years with the air force. 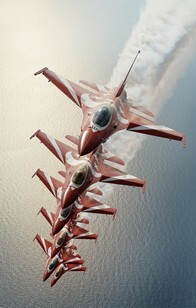 The RSAF Black Knights fly in a Chevron formation as the sun rises over the South China Sea. 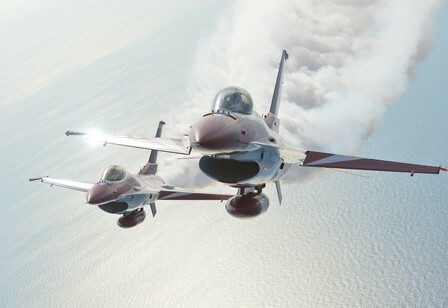 Black Knight 5 Major Eugene Lim (R), the team's Lead Solo, and Black Knight 6 Major Chang Haw Ning, the Opposing Solo, fly in close formation over the South China Sea. 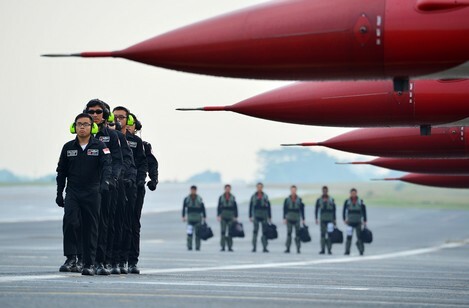 The six RSAF Black Knights discuss their manoeuvres as they walk back to their briefing room after a training flight. 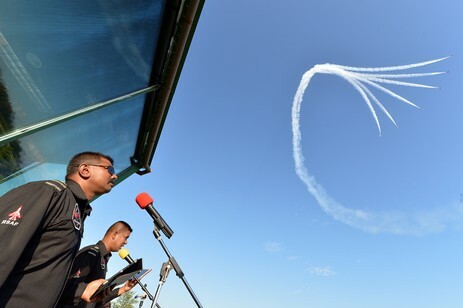 Major Chang Haw Ning, call sign "Jerky", flies the Opposing Solo position in the Black Knights aerobatics team. Their training began six months ago in preparation for Singapore's Golden Jubilee Weekend celebrations from 7 to 9 August 2015. 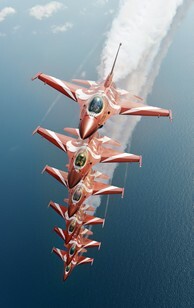 The six Republic of Singapore Air Force Black Knights fly in an Offset Right Stack formation over the South China Sea. To understand what these military aviators endure, I attended an aviation physiology training course (and passed the exam), experienced oxygen deprivation in a hypobaric chamber (solving maths questions took longer than usual), and attempted the Somatogyral Turntable - a rotating black box designed to make one lose all spatial perception when seated inside. 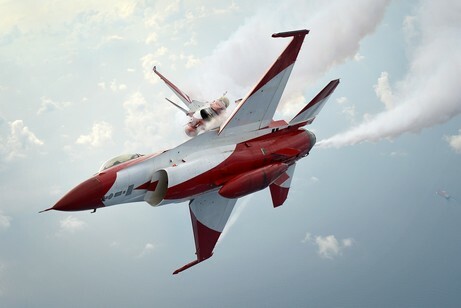 My biggest challenge, however, was riding the Human Training Centrifuge, a high-tech gondola whirled at speed to generate a continuous gravitational force. For this, I wore a tight-fitting anti-G suit with air bladders that would automatically inflate during moments of high acceleration. I also practised the anti-G straining manoeuvre - tensing all the muscles in my lower body and keeping my chest fully expanded while taking short breaths. Both of these would increase my overall blood pressure and maintain circulation to the brain, preventing the G-induced loss of consciousness that could lead to accidents. I pulled on a control stick and was pressed into the seat as the gondola accelerated. In the background, I could hear an instructor calmly counting off the numbers. At 6.5Gs, I released the controls and was immediately overwhelmed by intense nausea as the machine decelerated. In comparison, the Black Knights Lead and Opposing Solos endure up to 9Gs as they perform manoeuvres that will push the aircraft to their limits during the Jubilee weekend 25-minute display - one of the longest routines put up by the team. 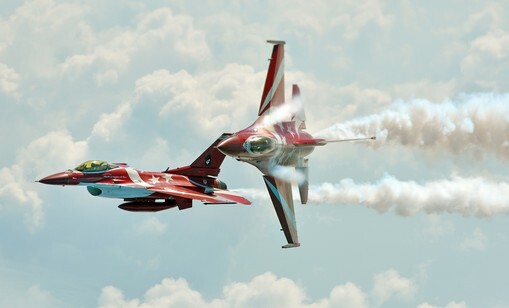 After the final flypast come Aug 9, the aircraft will be returned to their grey paint scheme, and the crew will rejoin their operational squadrons. The Black Knights will once again disband, until the next big occasion. 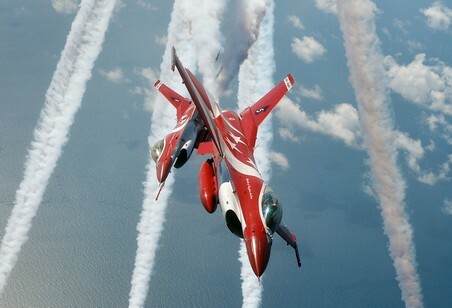 The public can catch the Black Knights in action from tomorrow to Sunday at noon for their 25-minute performance in the skies just off the Marina Barrage. Military Expert 2 Claire He checks the inside of the F-16 aircraft's exhaust nozzle during routine maintenance. Claire He checks the inside of the F-16 aircraft's exhaust nozzle during routine maintenance. 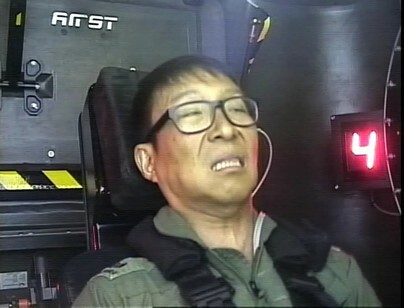 Straits Times photojournalist Alphonsus Chern performs the anti-G straining manoeuvre, or AGSM, as the Human Training Centrifuge spins him up to 6.5Gs. 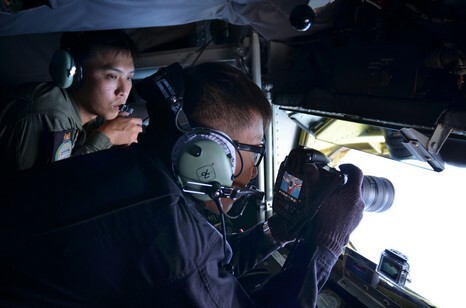 While on the ground, the aircraft are taken care of by flight line crew such as Corporal Sean Lim (L), 20, and Third Sergeant Koh Tiang Lip, 22. 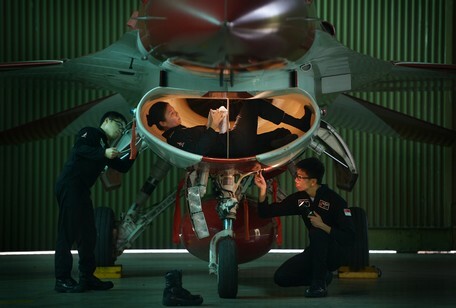 Military Expert 2 Claire He, 32, polishes the inside of the jet's air intake. 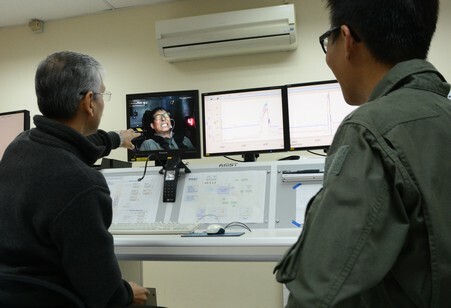 Dr Sanjiv Sharma (L), a Senior Aerospace Physiology Instructor reviews Straits Times photojournalist Alphonsus Chern's recent session in the Human Training Centrifuge at the ST Healthcare Aeromedical Centre.